Please be informed that TalentCap Sdn. 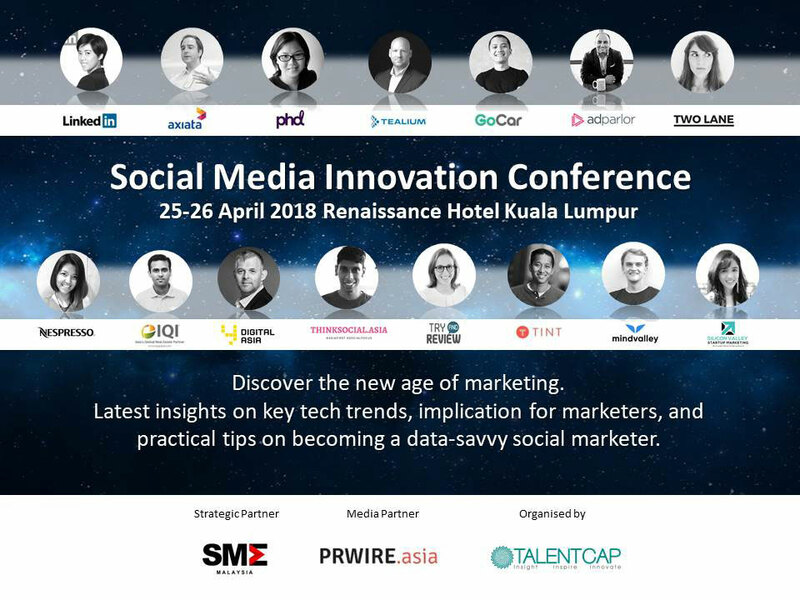 Bhd in collaboration with SME Association of Malaysia (SMEAM) would like to invite you to participate in the Social Media Innovation Conference “Discover the new age of marketing" on 25-26 April, 2018. The Social Media Innovation Conference will help you address the social media challenges and opportunities to create the greatest positive impact on your social media marketing strategy. Understand the value of social media, and determine the ROI of your marketing spend and make the most of every opportunity. Gain insights and strategies to crack the code of social, stay current on trends, and get better, more measurable results. Turn social media data into actionable customer insights to build personalized experiences and optimized customer journey. Discover how innovative, global companies are connecting analytics and social media marketing. Discuss best practices, strategies, and success stories for cross-channel campaign management. Discover how to leverage social media marketing analytics, and how to connect the dots back to your broader marketing efforts. Power personalized experiences across all channels to build brand loyalty and capture new customers.